The situation in Syria evolves daily and sees two situations very closely linked to each other, with the US withdrawal from Syria and the consequent expansionist ambitions of Erdogan in Syria and the Hay’at Tahrir al-Sham (HTS) takeover in Idlib that frees the Syrian Arab Army (SAA) and Russian aviation to liberate the de-escalation zone. Trump has promised to destroy Turkey economically if he attacks the Kurds, reinforcing his claim that Erdogan will not target the Syrian Democratic Forces (SDF) once the US withdraws from the area. One of the strongest accusations made against Trump’s withdrawal by his opponents is that no Middle Eastern force will ever trust the US again if they abandon the SDF to its fate, that is, to its annihilation at the hands of the Turkish army and its FSA proxies. This, however, is not possible; not so much because of Trump’s economic threats, but because of Damascus and Moscow being strongly opposed to any Turkish military action in the northeast of Syria. This is a red line drawn by Putin and Assad, and the Turkish president likely understands the consequences of any wrong moves. It is no coincidence that he stated several times that he had no problems with the “Syrians or Syrian-Kurdish brothers”, and repeated that if the area under the SDF were to come under the control of Damascus, Turkey would have no need to intervene in Syria. Trump’s request that Ankara have a buffer zone of 20 kilometers separating the Kurdish and Turkish forces seems to complement the desire of Damascus and Moscow to avoid a clash between the Turkish Armed Forces (TAF) and the SDF. The only party that seems to be secretly encouraging a clash between the SDF and Turkish forces is Israel, criticizing Ankara and singing the praises of the SDF, in order to try and accentuate the tensions between the two sides, though naturally without success. Israel’s continued raids in Syria, though almost constantly failing due to Syrian air defense, and the divide-and-rule policy used against Turkey and the SDF, show that Tel Aviv is now weakened and mostly irrelevant in the Syrian conflict. In Idlib, the situation seems to be becoming less complicated and difficult to decipher. Russia, Iran and Syria had asked Erdogan to take control of the province through its “moderate jihadists”, sit down at the negotiating table, and resolve the matter through a diplomatic solution. Exactly the opposite happened. The HTS (formerly al-Nusra/al-Qaeda in Syria) has in recent weeks conquered practically the whole province of Idlib, with numerous forces linked to Turkey (Ahrar al-Sham and Nour al-Din al-Zenki) dissolving and merging into HTS. This development puts even more pressure on Erdogan, who is likely to see his influence in Idlib fade away permanently. Moreover, this evolution represents a unique opportunity for Damascus and Moscow to start operations in Idlib with the genuine justification of combating terrorism. It is a repeat of what happened in other de-escalation areas. 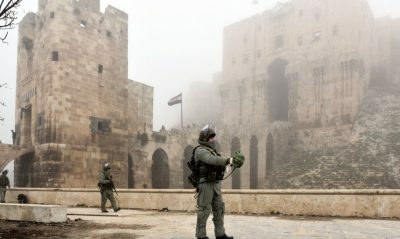 Moscow and Damascus have repeatedly requested the moderates be separated from the terrorists, so as to approach the situation with a diplomatic negotiation. In the absence of an effective division of combatants, all are considered terrorists, with the military option replacing the diplomatic. This remains the only feasible option to free the area from terrorists who are not willing to give back territory to the legitimate government in Damascus and are keeping civilians hostages. The Idlib province seems to have experienced the same playbook applied in other de-escalation zones, this time with a clear contrast between Turkey and Saudi Arabia that shows how the struggle between the two countries is much deeper than it appears. The reasons behind the Khashoggi case and the diplomatic confrontation between Qatar and Saudi Arabia were laid bare in the actions of the HTS in Idlib, which has taken control of all the areas previously held by Ankara’s proxies. It remains to be seen whether Moscow and Damascus would like to encourage Erdogan to recover Idlib through its proxies, trying to encourage jihadists to fight each other as much as possible in order to lighten the task of the SAA, or whether they would prefer to press the advantage themselves and attack while the terrorist front is experiencing internal confusion. In terms of occupied territory and accounts to be settled, two areas of great importance for the future of Syria remain unresolved, namely al-Tanf, occupied by US forces on the Syrian-Jordanian border, and the area in the north of Syria occupied by Turkish forces and their FSA proxies. It is too early to approach a solution militarily, it being easier for Damascus and Moscow to complete the work to free Syria from the remaining terrorists. 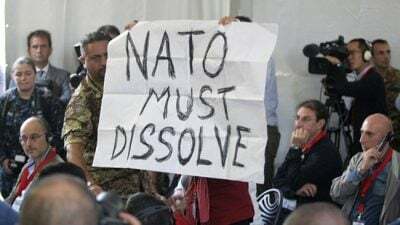 Once this has been done, the presence of US or Turkish forces in Syria, whether directly or indirectly, would become all the more difficult to justify. Driving away the US and, above all, Turkey from Syrian territory will be the natural next step in the Syrian conflict. This is an unequivocal sign that the war of aggression against Syria is winding up, and this can be observed by the opening of a series of new embassies in Damascus. Several countries — including Italy in the near future — will reopen their embassies in Syria to demonstrate that the war, even if not completely over, is effectively won by Damascus and her allies. For this reason, several countries that were previously opposed to Damascus, like the United Arab Emirates, are understood to have some kind of contact with the government of Damascus. If they intend to become involved in the reconstruction process and any future investment, they will quite naturally need to re-establish diplomatic relations with Damascus. The Arab League is also looking to welcome Syria back into the fold. Such are signs that Syria is returning to normality, without forgetting which and how many countries have conspired and acted directly against the Syrians for over seven years. 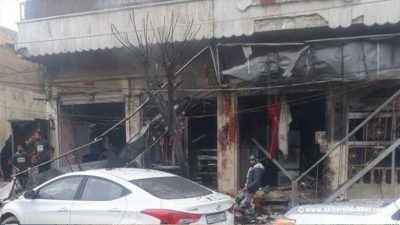 An invitation to the Arab League or some embassy being reopened will not be enough to compensate for the damage done over years, but Assad does not preclude any option, and is in the meantime demonstrating to the Israelis, Saudis and the US Deep State that their war has failed and that even their most loyal allies are resuming diplomatic relations with Damascus, a double whammy against the neocons, Wahhabis and Zionists. Peace activists are calling for the U.S. government to call off plans for a massive military construction project on the Japanese island of Okinawa. On January 7, a fourth generation Okinawan-American and local peace groups staged a demonstration and delivered a petition with 190,000 signatures to the White House. The petition calls for a halt of construction of a U.S. airbase at Ourawan Bay until a referendum can be held on February 24. The airbase would build an airstrip by filling in Ourawan Bay with boulders and dirt. Two 5,000-foot runways are planned which will eventually house the ultra-advanced U.S. F-35 fighter jets and V-22 tiltrotor aircraft. The bay is a pristine tropical water paradise and home to many rare aquatic species, including the Dugong, an endangered rare marine mammal. Construction over the bay began on December 18. The project has the backing of the mainland JapanPremier Shinzo Abe. Opposition to Futenma airbase and its relocation from Ginowan to Henoco District on Ourawan Bay dates back several decades with nearly 80 percent of Okinawans opposed to it. The specifics of the plan call for building the airstrips at the edge of Schaub Marine Base, a base camp for Marine infantry units rotating between South Korea, Guam, Mainland Japan, and the U.S. West Coast. There are 23 U.S. bases on Okinawa, taking up 20 percent of the Island land area. Okinawa compares as less than 1 percent of the land area of Japan but hosts 74 percent of the land area used by U.S. military forces in Japan and its islands. Okinawans believe they are saddled with an unfair responsibility for being tasked to yield far more land area by ratio than mainland Japan. Further, Okinawans host half of the 50,000 U.S. military personnel in Japan. Environmentalists say the Dugong marine mammal feeds on lush beds of marine grass within Ourawan Bay, but the new airbase will further endanger its existence there. By filling the bay with rocks to build two runways and a mile-long sea wall, the base will bury the lush source of sea grass, the home of the Dugong and many other rare species. Okinawa has been hampered by the presence of remnant U.S. base relics since World War II. Okinawa Prefecture is the southern most part of Japan which was annexed in 1879. Before it was annexed it had already established an island culture and autonomous Kingdom of the Ryukyu government for several centuries. It was the central part of the 1,000-mile chain of the Ryukyu Islands before Japan annexed it. The island saw almost total destruction in WWII during the battle of Okinawa as Marines landed and fought against Japanese soldiers. Almost 25% of its people were killed and every building was either destroyed or damaged. After the war Okinawa remained under U.S. administration until 1972. It was then given back to Japan’s control in March 1972, nearly 100 years after Japan annexed it. However, the U.S. maintained possession of a series of bases, including Futenma airbase. During the 1970s and 80s, the population grew as did tensions with the U.S. over incidents of assaults by U.S. military personnel. Okinawans urged mainland Japan to relocate Futenma airbase to the mainland and reduce U.S. military presence. They grew increasingly impatient for U.S. bases to be closed and the land to be returned to them. Civil disobedience and resistance grew out of plans to relocate Futenma airbase to Ourawan Bay which was announced in 1995. The original plan was to move Futenma to Henoco by acquiring private property inland but not over Ourawan Bay. The early plan was part of a secret proposal in the 1960s (since declassified) by Defense Secretary Robert McNamara during President Kennedy’s administration. In the 1970s and early 1980s, this plan met opposition as Okinawans began to mobilize in opposition. Once the second plan was publicized in 1995 to build the base over Ourawan Bay, Okinawans organized protests, sit-ins and day-long blockades outside Futenma and Schaub bases until police moved in. They have even launched water flotillas on Ourawan Bay as the Okinawa resistance took to kayaks in pitch battles with construction personnel. The resistance was originally fighting to close the base. But once the relocation plan to move Futenma airstrip to Ourawan Bay was made public, the blockades of Schaub Marine Base near Henoko became more intense. And they have sustained a spirited resistance ever since. They have organized marches, voted only for local candidates opposed to the Henoko project, blocked base entrances and sent delegations to the U.S. to urge cancellation of construction plans. Mayor Susumu Inamine of the city of Nago and then Japanese Congressman Denny Tamaki visited the U.S. in 2014 to urge President Barack Obama to cancel the project but was unable to meet with him. Denny Tamaki was elected as Governor of Okinawa in 2018 on a platform to block Henoco base construction. Tamaki visited the U.S. again in 2018 to lobby for U.S. base closures. His lyrics resonated with Okinawans and attracted international support. He believes music is an effective way to reach people through emotions. It has also been his way of helping to gain support for his fellow islanders and pay back his grandparents for their support for his education in Hawaii. 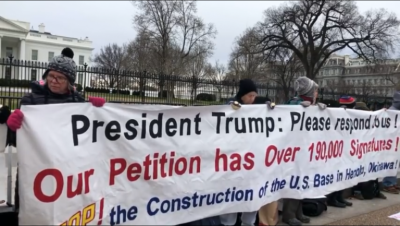 He delivered the petition to the White House on Monday hoping to urge the Trump Administration to cancel the project. But he believes Americans also have an important stake in the new battle for Okinawa. “There are a plethora of reasons why this base is bad for America, and I am trying to bring these reasons to their attention,” said Kajiwara. He says the project will also hurt Americans by costing much more money than previously estimated. An analysis of military plans show the project has ballooned to $23 billion, more than 10 times the original cost estimated in 2013. It will also take five years longer to complete the Ourawan Bay fill and stabilization process that was previously estimated at 5 years. This is due to a discovery by civil engineers that Ourawan Bay contains sediments that are much more soft than previously thought. The ancient coral reef geology under the coastal water is not supported by the heavy loads of an airbase so the fill dirt project will take more time to reinforce, the report claimed. There is also the consideration of periodic earthquakes which could cause subsidence under the base and have to be remedied. Kajiwara said there are many stories about the elderly protestors that have yet to be told, and he wants to help them share stories with the world. He spoke of two elderly protesters who were arrested and charged with felonies. He believes they were targeted because of successful organization efforts. “Hiroji Yamashiro and Hiroji Inaba are two of the most prominent leaders of the movement, and they were arrested and sentenced as felons for their protests. They recently filed an appeal, but their appeals were denied,” he said. Dozens of elderly protesters are forcibly moved on a daily basis. Their resistance has taught the younger generations about non-violent protest and delayed the Henoco airbase project by two decades. David Swanson, Director of World Beyond War, said that the people have the right to freedom from occupation by U.S. forces as well as the freedom of an environmentally safe home. “Occupying Okinawa does something negative to the people of Okinawa. They are denied the freedom of not being the prime target of attack, the freedom not to have their water poisoned, and the freedom from massive environmental destruction,” he said. One of the issues Okinawans must also contend with is polluted water from over 70 years of U.S. military operations. Water quality has been effected with fuel spills, fire drills from fire-retardant foam, grease and solvent and petroleum runoff from military operations. Kajiwara is hopeful the base can be stopped even though construction began in Ourawan Bay a few weeks ago. He cites the tenacity of Okinawans, their love of each other and their concern for the environment as strengths. “They have been fighting for decades, and they’re not going anywhere,” he said. Washington has moved to delegitimise democratically elected Venezuelan President Nicolas Maduro, with US Vice-President Mike Pence offering support to an opposition politician claiming to be the country’s real leader. In a phone call to National Assembly speaker Juan Guaido, Mr Pence praised his “courageous leadership” and called on him to unite all opposition groups against Mr Maduro. The National Assembly has no legitimate role in Venezuela since the establishment of the Constitutional Assembly, which was elected in August 2017 despite violent attacks from right-wing opposition groups seeking to stop people from voting. However, following Mr Maduro’s inauguration last week, the body declared Mr Guaido to be the country’s “acting president” and refused to recognise Mr Maduro, despite him having won a second term of office last May with a thumping 67 per cent of the vote. He endorsed Mr Guaido’s claim to be interim president, which has also been recognised by the right-wing governments of Brazil, Chile and Colombia. It is understood that Mr Guaido also has the support of the Organisation of American States, whose secretary-general Luis Almagro was recently expelled from the Frente Amplio party in his native Uruguay for backing intervention against Venezuela. Mr Pence said that Washington would continue “to press for a full restoration of democracy” in the country. The US has long sought regime change in Venezuela, implementing a raft of punitive sanctions and other measures. Last year it emerged that US President Donald Trump had given serious consideration to military intervention against Venezuela, including the possibility of a ground invasion to topple Mr Maduro. Yesterday, the Washington Post published a column by Mr Guaido in which he accused Mr Maduro of being a dictator with links to drug trafficking and guerilla groups and demanded his overthrow. Canadian Prime Minister Justin Trudeau, the darling of liberals, has also branded Mr Maduro a dictator, refusing to recognise his presidency. However, at a university debate yesterday, he refused to answer questions about his support for far-right Brazilian President Jair Bolsonaro. The greatly intensified austerity that has been imposed in the UK since 2010 has been looked to with considerable approval by right wing imitators. Among countries that had developed a relatively adequate ‘welfare state’, the attack on social provision in the UK has been outstandingly severe. One of the key elements of this has been a drive to degrade social benefit systems. The central objective has not been, as is generally claimed, to save money but rather to ensure a level of desperation that drives people into low wage precarious work and depresses the level of real wages. In Canada, where a federal system of government exists, most of the political decisions related to the undermining of social programmes are taken at the provincial level. It is worthwhile to compare the specific assault on income support in Ontario, the province with the largest economy and population, with the situation that has unfolded in the UK. Before doing this, however, I want to go a little deeper into why the architects of neoliberal austerity have placed such emphasis on reducing the adequacy of systems of income support that unemployed, poor and disabled people turn to. When the peasantry was being driven from the land in England, the Tudor authorities at first imagined that the anger of the dispossessed could be contained with large doses of state violence and intimidation. However, the jobless and homeless portion of the new working class created a public order problem that required a reluctant concession. This took the form of the Poor Laws and, as is still the case with modern income support systems, they were intended to maintain social stability while offering the least attractive alternative possible to the worst jobs on offer. The 1834 New Poor Law articulated a principle of ‘less eligibility’ that has cast its shadow over benefit systems ever since. The terms and conditions of receiving relief, featuring the dreaded workhouse, would ensure that recipients would be worse off than the poorest workers. Modern benefit systems, with bureaucratic intrusion and moral policing replacing the workhouse, retain the guiding principle of less eligibility. The Ken Loach film, I, Daniel Blake demonstrates this very starkly. It is often suggested that ‘austerity isn’t working’. In fact, in both the UK and Ontario, the degrading of benefit systems has produced startling results for employers, especially those paying the lowest wages. If benefit levels had not been driven down and made more punitive and precarious, it is hard to imagine how the proliferation of low wage precarious work could have been so successfully imposed. Sluggish wage growth exists in all OECD countries but the UK’s long-term decline in real wage levels is especially stark. The numbers of people forced into precarious employment has shot up and the increase in workers forced to accept zero hour contracts has been dramatic. Changes in the level of exploitation and the expansion of the low wage sector have been comparably appalling in Ontario. In 1997, only one worker in forty was forced to accept a minimum wage job but, by 2015, that had increased to one worker in eight. By 2013, among workers in the densely populated Greater Toronto and Hamilton areas, barely half were in permanent full-time jobs. Until recently, when a hard-right Tory Government took office, the task of imposing austerity and reducing the adequacy of the social assistance system in Ontario was in the hands of a Liberal Government. As the dubiously progressive face of the neoliberal mainstream, the Liberals were somewhat circumspect in how they carried out the attack. Their task was made easier by the work of an earlier Thatcher-like Tory regime that held office from 1995 until 2003. Brutal cutbacks in the social assistance rates were an accomplished fact and the Liberals spent most of their fifteen years in office providing parsimonious increases below the rate of inflation while holding round after round of public consultations to keep alive the illusion that they would address a growing crisis of poverty and homelessness. At the very end of the Liberal period, after so successfully reducing the adequacy of Ontario’s income support system and driving people into a mushrooming low wage sector, they concluded that the attack could be eased and they tactically shifted to the left. Under considerable pressure from a ‘Fight For $15 and Fairness Campaign’, they increased the minimum wage, announcing that it would rise to $15 in 2019, and introduced a series of measures to strengthen workers’ rights. They also announced a 3% increase in social assistance rates that, while inadequate, would be the first general increase that exceeded the rate of inflation since 1994. They also announced a series of modest but beneficial measures to improve the lives of people receiving benefits. When the new Tory regime took office last June, there was no delay in moving towards a more ruthless and extreme form of war on the poor. The minimum wage increase was cancelled and the scheduled improvements in social assistance met the same fate. The Tories even cancelled the basic income pilot project that the Liberals were running. While many neoliberal thinkers look approvingly at the concept of basic income, the Ford Tories, as meat and potatoes reactionaries, had no interest in anything that smacked of reduced conditionality. The attitudes of former work and pensions secretary, Esther McVey, and her Ontario counterpart, Lisa MacLeod, on this social policy proposal are striking similar. After killing off the impending reforms and cutting the 3% rate increase in half, the Ontario social services minister declared a review of the social assistance system. The results of this are predictably horrifying and chart directions that will be familiar to those in the UK who have experienced or resisted the Tory attack on social benefits under Cameron and May. MacLeod is very fond of the right wing cliche that ‘the best social programme is a job’. This is the key to the Ontario Tory approach to ‘welfare reform’. Having acted to preserve poverty wages, the plan is to refine the social assistance system as a means of forcing people into the worst jobs. In the UK, the work capability assessment has been used to brutally and systematically deny benefitsto disabled people. The Ontario Tories share the goal of ensuring that disability benefits are restricted massively so as to give disabled no option but to enter the job market. Their solution is to change radically the definition of disability. The Ontario Disability Support Program (ODSP) will now only be for those who can show that are permanently and severely impaired with no prospects of taking employment. All others will be forced onto the ‘short term’ Ontario Works (OW) programme where they will be treated as job ready workers, regardless of their situation. At the same time, OW is to be reworked as a much more coercive supplier of low wage workers. Just as benefit sanctions and claimant commitments have been used to ensure people in the UK understand they must scramble for employment on the employers’ terms, the Ontario plan takes similar directions. ‘Placing a greater focus on outcomes’, people will ‘complete individual action plans’. Municipalities that function as delivery agents ‘will be held accountable for helping people achieve their goals’ (provided those goals include working for low pay with no rights and few supports). So directly is the refined system to work as a supplier for the most exploitative employers that the Tories are ‘launching a website, Ontario.ca/openforbusiness to make matching job seekers with businesses easier’. The vilest employers will know where to go for a supply of vulnerable workers who must accept employment on their terms or face loss of benefits and outright destitution. Theresa May’s recent claim that austerity is over is exposed as a lie as communities in the UK experience the horrible effects of the roll out of Universal Credit. In Ontario, too, austerity and the degrading of benefit systems is a work in progress. What must be understood is that this attack doesn’t only impact the poorest people. It is a careful and ruthless strategy to increase the supply of super exploited workers and, in doing so, depress wages generally. 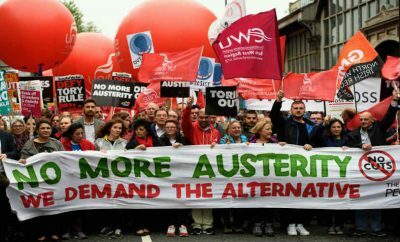 The broad working-class movement has a stake in resisting this attack and defeating the austerity driven war on the poor. Taking the art of fake news to new heights, a non-profit has circulated mock Washington Post issues near the White House, telling readers that President Donald Trump fled to Crimea on the back of women-led protests. Hey @washingtonpost: Someone is passing out fake copies of the paper (top)? For comparison, a real issue of the Post below. The paper “reports” that Trump abruptly left his office at 3:15am on May 1, leaving a message on a napkin in the Oval Office that blamed “crooked Hillary,” the mysterious “Hfior,” and “the Fake News Media” for his flight. 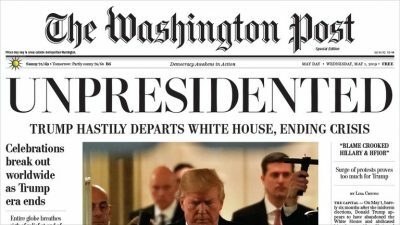 The report, meticulously mimicking the Washington Post’s source-based reporting style, cites “four White House aides” speaking on condition of anonymity, that they found the napkin two days before events took a dramatic turn.Trump’s fictional resignation and the subsequent swearing-in of Vice President Mike Pence, who instantly promises to keep as low a profile as possible, comes amidst “massive protests” staged by a grassroots movement with #MeToo as its backbone. The protests are accompanied by a campaign of harassment against White House officials and Republican lawmakers, similar to what some liberal activists have been calling for in the real world. In what would be a dream come true for Rep. Maxine Waters (D-CA), the fake newspaper says that officials’ “credit cards were declined repeatedly at bars and restaurants,” they were “openly heckled” or had “their order lost or bungled” and ultimately were forced to use aliases or feel “like pariahs” in their home cities. The news of Trump’s resignation sparks a wave of celebrations across the globe, with European countries refusing to shelter him. The creators of the fake diligently stick to the Washington Post’s style, fanning the Russia collusion narrative just like their prototype by sending Trump to seek safe haven in Russia – namely, Crimea. While there has been speculation that radical liberal political activist group MoveOn or CODEPINK, a women-led grassroots NGO, might be behind the stunt since they promoted the action, later in the day, The Yes Men, a progressive non-profit group, claimed responsibility in a press release. Apart from the printed editions, the group made the paper available online at my-washingtonpost.com/ and democracyawakensinaction.org. In addition, it sent out emails from noreply@my-wahsingtonpost.com to notify readers. While the actual Washington Post has distanced itself from the stunt, it later decided to play along, publishing an article referencing the one in the fake edition, telling about “The Bundle,” a set of 64 progressive bills aiming to make education free, guarantee employment, and make everyone eligible for Medicare. We figured such an article might as well exist on our actual site. There are currently 64 players listed on the Bills’ roster. “This doesn’t help at all. We already have too much fake news floating around,” another wrote. The Yes Men co-founder Andy Bichlbaum defended the stunt, telling Wired it’s obvious that the websites and the copies are fake. “If you look at the website, I think you might agree it would take someone very strange to spend much time believing it’s true,” he said. For years Israel denied allegations that it had a role in funding and weaponizing the anti-Assad insurgency in Syria, and more often military officials responded “no comment” even when confronted with overwhelming evidence of Israeli weapons documented in al-Qaeda linked insurgents’ hands, but this all changed in a new British Sunday Times interview with outgoing Israeli army commander Gadi Eisenkot,who has finally confirmed the Israeli Defense Forces (IDF) supplied weapons to rebels across the border “for self-defense,” and further perhaps more stunningly, has admitted to long waging an “invisible war in Syria” that involved “thousands of attacks”. The interview constitutes the first time that any current top Israeli military or government official has fully acknowledged sending anything beyond “humanitarian supplies,” such as medical aid to Syrian militants seeking to topple the Assad government; and yet it still appears the country’s military chief is slow playing the confirmation, only acknowledging the IDF provided “light weapons” — even after years of reporting has definitively uncovered an expansive Israeli program to arm dozens of insurgent groups and pay their salaries, includingknown affiliates of al-Qaeda in Syria. This comes after the Syrian government has for years accused Israel of partnering with the west and gulf countries, such as the US, UK, Saudi Arabia, Qatar, and Turkey of funding and weaponizing an al-Qaeda/ISIS insurgency as part of covert regime change operations aimed at Damascus and its allies Iran and Hezbollah. Since then, countries like Qatar have come forward to reveal just how vast their covert role in fueling the Syrian war really was, which we covered in our story, In Shocking, Viral Interview, Qatar Confesses Secrets Behind Syrian War. 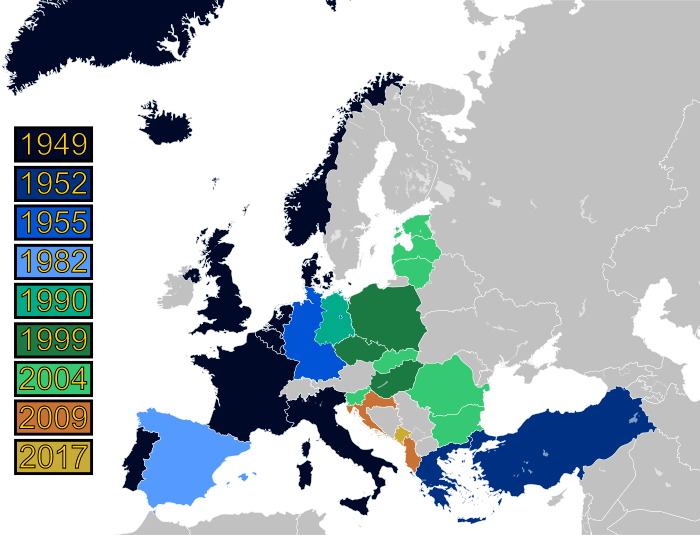 Eisenkot acknowledged for the first time, however, that Israel had supplied rebel groups in the border area with light weapons “for self-defence”. Israel was a hidden player on a crowded Syrian battlefield. Eisenkot positively boasted in the interview that “We operated in an area controlled by the Russians, sometimes attacking targets a kilometre or two from Russian positions,” in order to strike at Iranian assets in Syria. The rare “confession” of sorts comes at a moment the White House says it’s moving forward on President Trump’s previously announced US troop pullout from Syria, something which has rattled Israel’s leadership, which has argued that Iran will become entrenched near Israel’s border as a result. Eisenkot’s words appear a warning to Iran that Tel Aviv aims to maintain operational capability inside Syria. “We carried out thousands of attacks [in recent years] without taking responsibility and without asking for credit,” he told the Sunday Times. Given that prior military officials have typically put this number at “hundreds”, often from 200 to 400, this is an astounding admission that confirms Israel and Syria have been in a de facto state of open war since the first acknowledged Israeli airstrikes began in 2013. Foreign Policy said that Israel’s support for the rebel groups began in 2013, funding groups in places such as Quneitra and Daraa. It ended this summer as the regime’s forces advanced and made increasing gains in southern Syria against rebels. Syrian President Bashar Assad’s troops regained control of the border area in July. The Syrian army said in 2013 that it had seized Israeli weapons in rebel hands. The report said Israel sent the rebel groups weapons that included assault rifles, machine guns, mortar launchers, and vehicles. It initially sent the rebels US-made M16 rifles that would not identify Jerusalem as the source, and later began supplying guns and ammo from an Iranian shipment to Lebanon’s Hezbollah group that Israel captured in 2009, according to Foreign Policy. But a number of analysts have suggested Israeli support to the opposition began even closer to the start of the conflict. A prior Wall Street Journal investigation found that this relationship involved weapons transfers, salary payments to anti-Assad fighters, and treatment of wounded jihadists in Israeli hospitals, the latter which was widely promoted in photo ops picturing Netanyahu himself greeting militants. As even former Acting Director of the CIA Michael Morell once directly told the Israeli public, Israel’s “dangerous game” in Syria consists in getting in bed with al-Qaeda in order to fight Shia Iran. 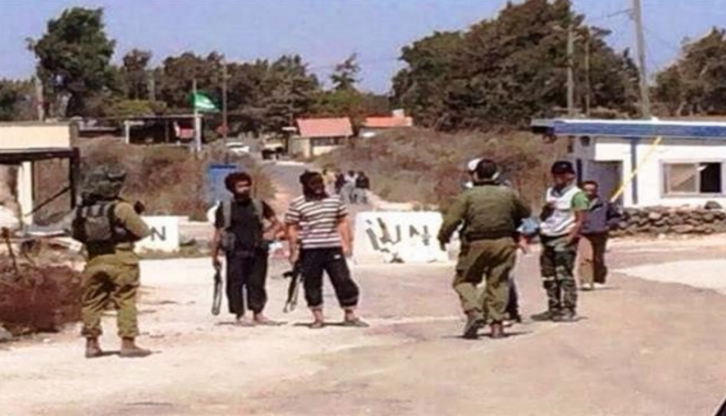 Prior widely shared photo of Israeli soldiers speaking face to face with al-Qaeda fighters near the Israeli occupied Golan heights in Syria. What is clear, and now finally settled for the historical record, is that for years Israeli concealed its “hidden hand” in the proxy war while feigning merely “humanitarian aid” — something now fully admitted by Israel’s top military commander. In other words the humanitarian smokescreen was cover for a full-on covert war on Damascus, as we and many other independent outlets have reported many times, and for years. Yet another past “conspiracy theory” becomes today’s incontrovertible fact. Reports are circulating in the Pakistani press that the Russian company is interested in several power projects in the country, which could pave the way for Moscow to unofficially invest in CPEC without angering its Indian partners. Many Pakistanis are excited by the news that Russian company Inter RAO Engineer is interested in several power projects in the country, potentially willing to commit the whopping sum of $2 billion worth of investments if their counterparts are receptive. While nothing has been officially confirmed, these reports are plausible enough given the fast-moving rapprochement between Russia and Pakistan over the past couple of years, which aims to establish a strategic partnership that the author coined with the catchphrase of “Rusi-Pakistani Yaar Yaar”. It evidently appears as though Russia is diversifying its outreaches with Pakistan from their former Afghan-related anti-terrorist centricity to a more robust partnership that’s now taking on important energy dimensions. It shouldn’t be forgotten that Russia already committed to building the North-South gas pipeline and signed a memorandum of understanding for constructing a $10 billion offshore onebetween Iran, Pakistan, and possibly even India too one day. In a sense, it can be said that Russia’s “traditional diplomacy” with Pakistan evolved to “military diplomacy” and now “energy diplomacy”. Attention should be paid to the latest report’s claims about how Inter RAO Engineering is supposedly interested in the proposed Mohmand Dam along the Swat River in the former mountainous Afghan-bordering region of what used to be called the Federally Administered Tribal Areas (FATA) prior to its merger with Khyber-Pakhtunkhwa last year. This is highly symbolic because the words “FATA” and “Swat” remind many Westerners of the country’s War on Terror during the mid-2000s, so it says a lot about the overall sub-region’s newfound stability that Russia would consider investing there. Importantly, $2 billion worth of potential investments in Pakistan’s power industry would signal that Russia wants to get in on the country’s CPEC-related Chinese-driven construction boom but is doing so without openly attaching itself to the CPEC “brand” out of concern for its Indian partner’s political sensitivities. 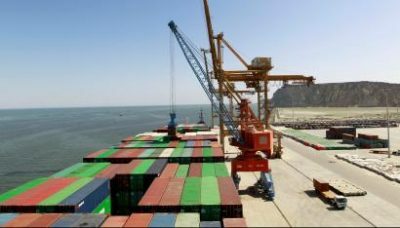 New Delhi is dead-set against CPEC because of its stance that the series of megaprojects transit through territory that India claims as its own per its maximalist approach to the Kashmir Conflict, and the renaissance of relations between it and Russia would be ruined if Moscow invested in CPEC. That explains why Russia might reportedly be considering investing in CPEC without formally doing so, following the strategy that the author previously suggested in his piece last summer about “Creative Non-CPEC Marketing Strategies For Pakistan”. So long as Russia abstains from officially endorsing CPEC and attaching its investments to that “brand”, then its relations with India won’t suffer no matter how many billions of dollars it eventually pours into Pakistani projects. With that being the case, the latest reports are an encouraging sign of Russian intent and could portend more unofficial CPEC investments. 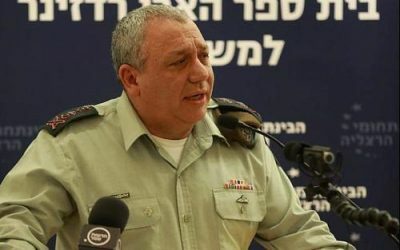 In an interview to New York Times  on January 11, Israel’s outgoing Chief of Staff Lt. General Gadi Eisenkot confessed that the Netanyahu government approved his shift in strategy in January 2017 to step up airstrikes in Syria. Consequently, more than 200 Israeli airstrikes were launched against the Syrian targets in 2017 and 2018, as revealed by the Israeli Intelligence Minister Israel Katz in September last year.